Flour Power : Regan Gentry. 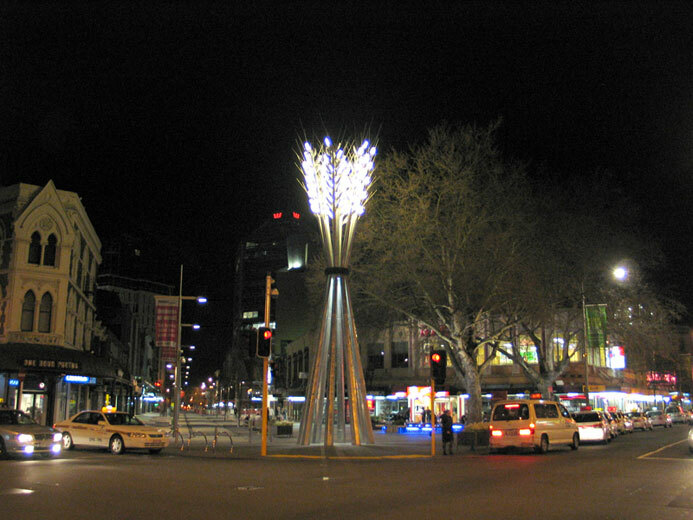 Eight and a half steel power poles with 153 street lamps arranged to resemble a sheaf of wheat. Permanent work. 15m x 4m x 4m. 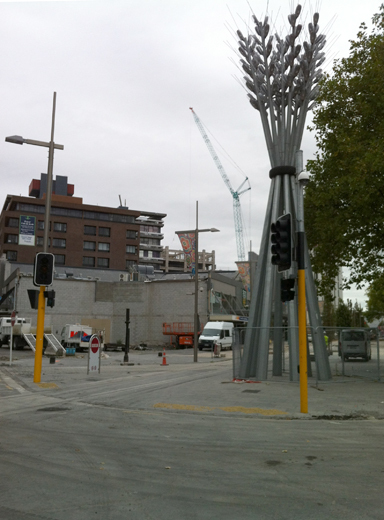 'SCAPE 2008', Stewart Plaza, Christchurch. 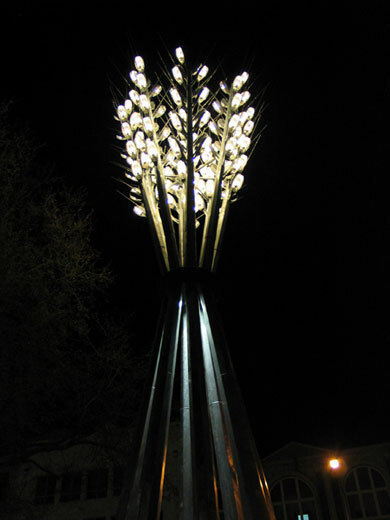 Commissioned by the Christchurch City Council’s Public Art Fund for SCAPE 2008 with support from Project City Mall and Adrienne, Lady Stewart and the Estate of the late Sir Robertson Stewart. Flour Power - Abby Cunnane. Monumental architecture is impressive, lofty trees stately; colossal sculpture frequently approaches the absurd. Regan Gentry’s Flour Power, a massive wheat sheaf made of 13 metre tall galvanised steel lampposts, seemingly courts comic surreality in both scale and context. 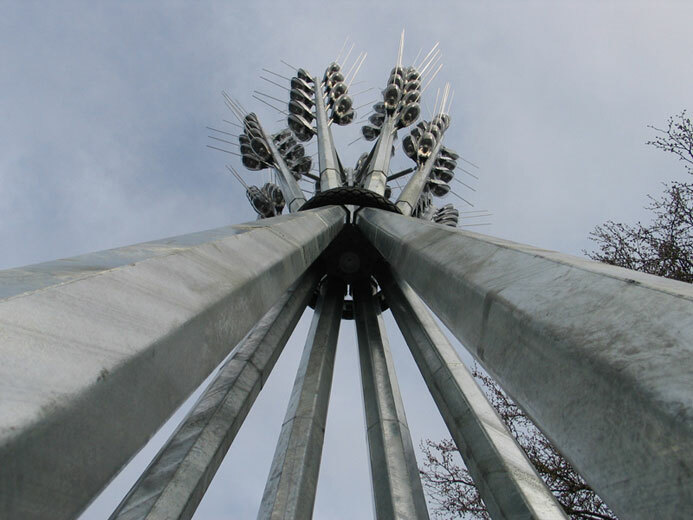 If it joins other large-scale kitsch sculptures including Ohakune’s carrot, Taupo’s trout and Te Kuiti’s golden shears, the sculptor relishes the position, and yet moves beyond it. Earlier works — a lounge in a skip bin, a forest of number 8 wire trees, a five metre long deckchair strike a similar chord — but always there is an underlying tenet firmly located in materiality, and in pithy narrative. When commissioned to contribute a permanent piece to Christchurch city as part of SCAPE, Regan Gentry saw in the brief the opportunity to actively engage with local industry, as well as with local history. This was partly pragmatism: graduating to a work on this scale, working predominantly with ‘found’ materials already part of the city infrastructure, and time restrictions meant it was no longer practicable for the sculptor to carry out every part of the process himself, and local engineering firms were brought on board. Caught by the scale of Christchurch’s sprawling malls and suburban areas, wide sweeping roads and seemingly uninterrupted traffic flow, Regan turned to local histories to investigate the basis of the region’s municipal growth. 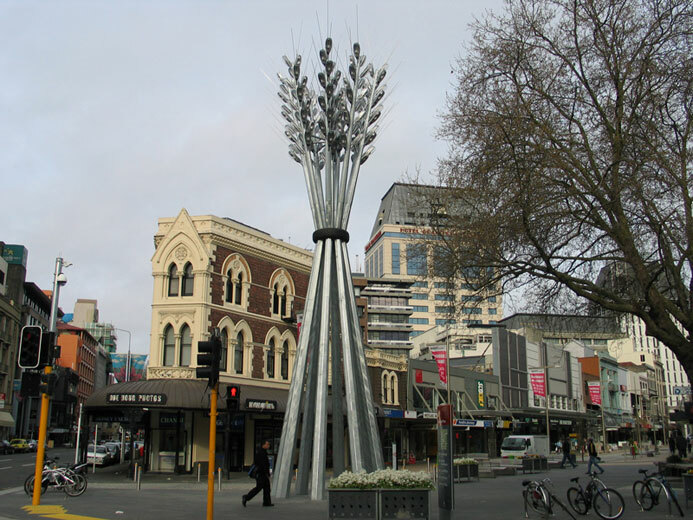 Historically, lucrative wheat crops spread in a wide burnished colourfield from Christchurch’s urban centre. The crop was the foundation of early economic development. Much local nostalgia is linked to wheat; the city was home to the now demolished Edmonds Factory along with fine traditions of baking, and agriculture remains significant to contemporary Christchurch identity.The ‘stooked’ (stacked to dry) sheaves, a scene which historically caught the attention of Van Gogh, Gauguin, Millet and others was to be transformed through the simple reconfiguration of familiar urban landmarks — standardised lamp posts, streetlights and a tyre. 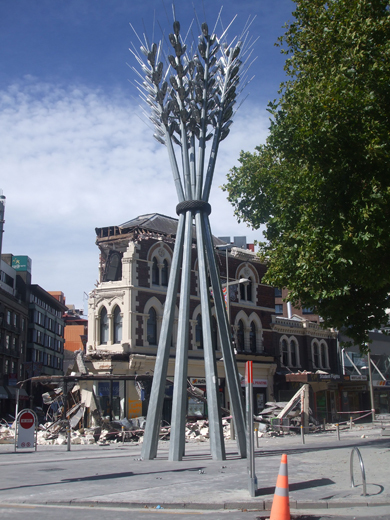 Christchurch audiences have already seen (in numerous contexts, including the city’s coat of arms) what the sculpture makes newly visible; in the local setting it taps cultural memory. Extending this vision, the city’s streets become like rows, parched like harvest-bared fields. Flour Power is located in Stewart Plaza, a pedestrian congregation point at the intersection of Colombo, High and Hereford Streets. 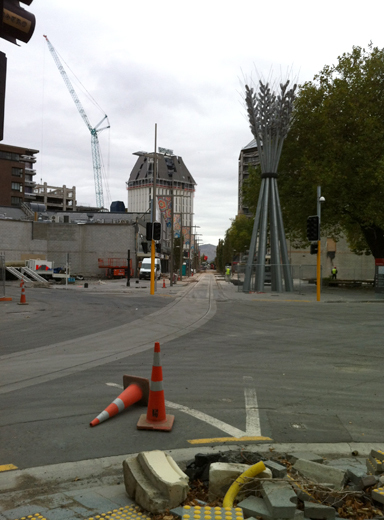 Pedestrians will move through and around the work, on first glance perhaps simply identifying it as lampposts. There is a clear view through to Phil Dadson’s Nucleus at the corner of Manchester and Lichfield Streets, and to Neil Dawson’s Chalice in Cathedral Square. 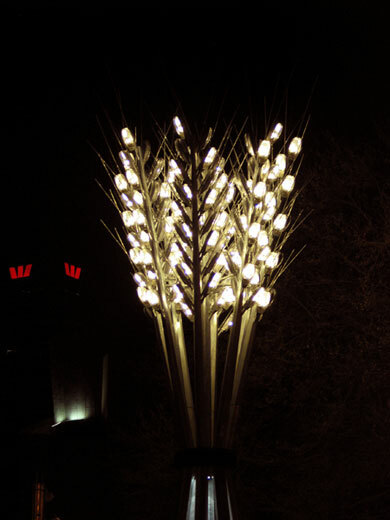 Surrounded by an imposing architectural theatre of the Holiday Inn and Westpac building, the Grand Chancellor Hotel, and the BNZ building, all symbols of contemporary currency, this sculpture explores a natural form which represents an older currency in the region. A statement of permanence and the continuation of local tradition sit easily alongside the oldest player in the theatre, humour.